Traditional glove puppet theatre from Kerala in south-west India. 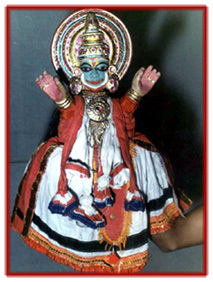 Pavakathakali (glove puppet kathakali) was probably born in the 18th century, one hundred years after the blossoming of kathakali (lit. “story play”). 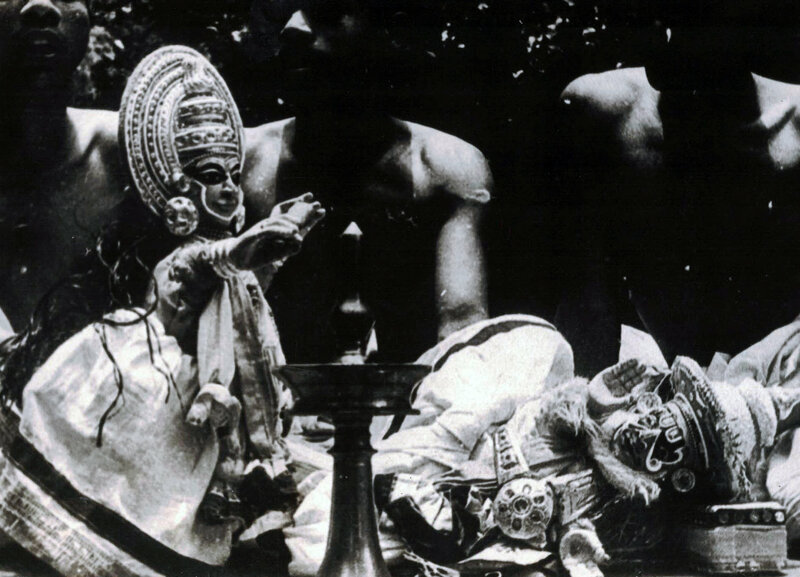 The dance drama, which had become the standard, gave the idea to local puppeteers to dress their puppets in kathakali costumes and adopt the themes of the attakatha, the stage interpretations of this drama. Pavakathakali performers from the Andipandaram community belong to a small number of families from the Paruthippuly village in the Palghat (Palakkad) region. Their ancestors appear to have emigrated from Andhra Pradesh during the 14th century to establish themselves in Kerala. The Andipandaram, who worship Subramanya (Subramania, Murugan), make their living by organizing blessings, called puja, in villages and homes and by guiding pilgrims all the way to the Subramanya temple at Palani. 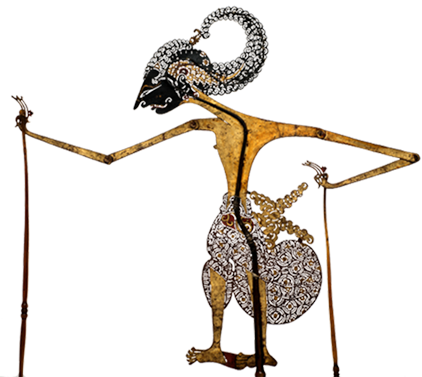 The pavakathakali puppets measure between 40 and 60 centimetres in height. The finely sculpted head and arms are attached by thick cotton knots on a small bag. The puppets are very colourful, adorned with fine, small metallic golden ornaments, cowrie shells, coral, gemstones, peacock feathers, etc. 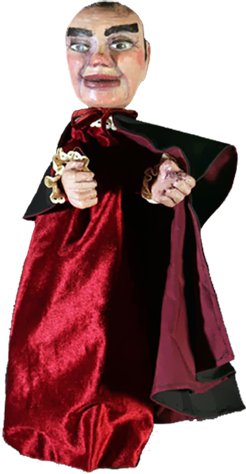 The puppeteer places his hand in the bag and manipulates the puppet’s arms with the thumb and middle finger and moves the head with the index. The puppet’s gestures require great dexterity. In the past, pavakathakali performances did not need the construction of a stage or podium. The group of puppeteers went from house to house, to entertain especially the women and children, and would set themselves up in the courtyard. When such itinerant performers arrived in the ancestral homes, the hosts took care of their needs for the performances generated much excitement in children. The musical instruments – the same as used for kathakali – are comprised of a chenda (drum), chengila (gong), illetalam (cymbals) and shankh (mother of pearl conch shell) and accompany one or two singers. The minimum number of puppeteers to perform a show is six. When the nilavilaku (copper lamp) is lit in the courtyard, the puppeteers sit on the ground and start the performance. There is no barrier between them and the spectators. 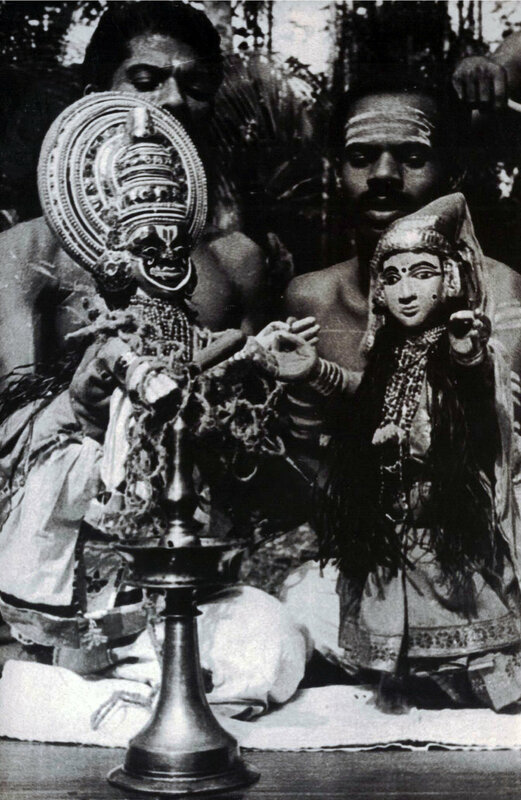 The puppeteers receive a salary (arangupanam) for each performance. The most performed episodes from extracts of the Mahabharata are Kalyanasaugandhikam (The Flower of Good Fortune) and Duryodhanavadham (The Slaying of Duryodhana). Pavakathakali was widespread until the 1940s; it then started to decline. In 1981, pavakathakali came back to life thanks to Kamaladevi Chattopadhyay (1903-1988), the director of the Sangeet Natak Akademi (The National Academy for Music, Dance and Drama) in Delhi. 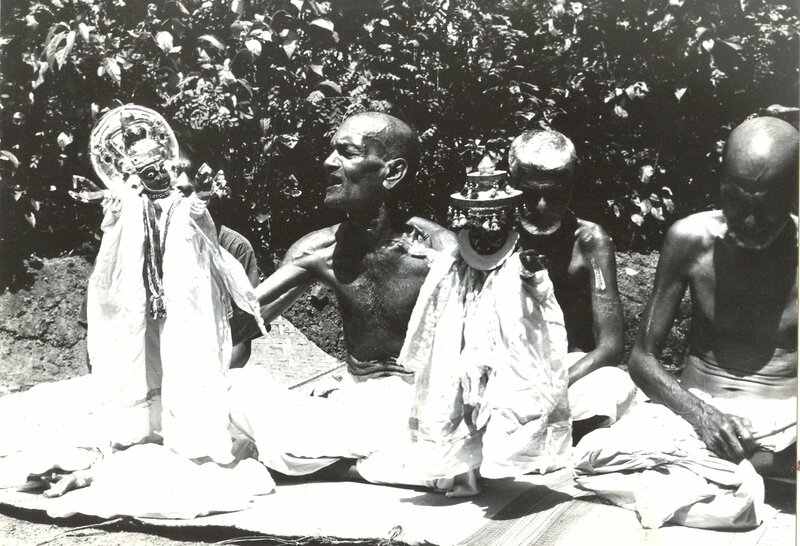 At that time, only three puppeteers were still alive in the Paruthippuly village. Thanks to six volunteers from the village and after two years of practice, the Natana Kairali Research & Performing Centre for Traditional Arts created a programme and trained performers. Pavakathakali found its public again in Kerala. In 1984, the troupe was invited to Poland for the International Puppet Festival and continued its international tour in 1987 at the Maison des Cultures du Monde (World Cultures Institute) in Paris, and in Geneva. Today, pavakathakali is recognized worldwide and continues its work in the Irinjalakuda village, sponsored by the umbrella organization Natana Kairali (under the artistic direction of Gopal Venu). Its repertoire includes the two above-mentioned episodes from the Mahabharata and the play Dhakshayagam (Dhaksha’s Sacrifice) from the Padma Purana. In 2010, K.V. Ramakrishnan and K.C. Ramakrishnan, performers of pavakathakali, received the national Sangeet Natak Akademi Award for their contribution to Indian puppetry.